Bring the magic to your homes with the My Magical Story Collection featuring all your favourite Disney Pixar characters! My Magical Story Collection includes a special Disney Pixar story series and a bespoke Collector's Case for you and your family to enjoy. 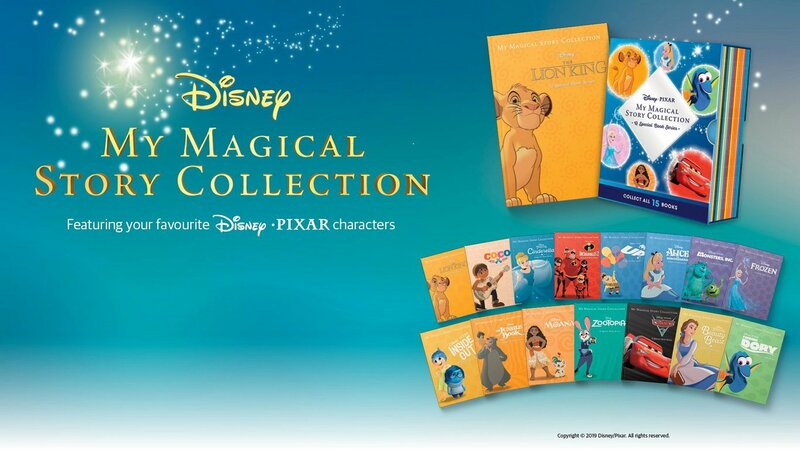 This enchanting collection comes complete with 15 of your favourite Disney Pixar story books: The Lion King, Coco, Cinderella, The Incredibles 2, UP, Alice in Wonderland, Monsters Inc, Frozen, Inside Out, The Jungle Book, Moana, Zootopia, Cars 3, Beauty and the Beast and Finding Dory. These titles are all housed in a bespoke Collector’s Case. Bring the My Magical Story Collection home today! The collection is only $39.20 for +Rewards members, includes postage and handling. These exciting tales, timeless classics and family favourites will be enjoyed by families for years to come. Limit one redemption per eligible member. Limited to the first 2450. Offer available while stocks last. Delivery to Australian residential addresses only. Advertised price includes postage and handling.